The start of the year is super-exciting here at PA HQ, and we have another week of new releases ahead of us just before we head off to yet another trade show later this week - Stitches, or CHSI (Craft hobby and Stitch International) in Birmingham, UK, Feb 17-20. I have been beavering away getting all the kits sorted out for the 12, yes 12 !! classes which several of our designers and I will be teaching to retailers at this event. I think we still have a few spots left in classes, so any qualified retailers can book directly with us on our wholesale website. Worth heading on over for a look as we have been updating photos in the past 2 weeks for many of the classes! 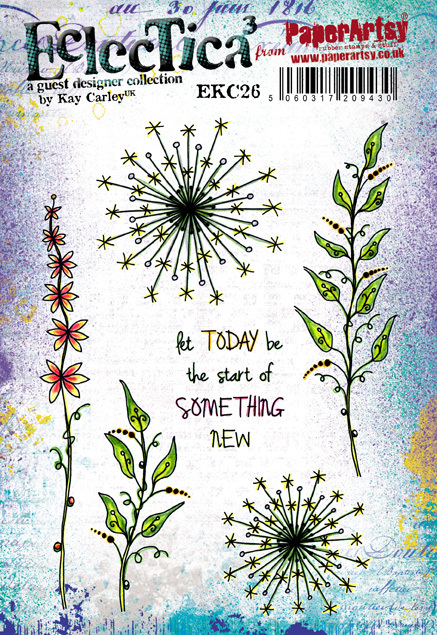 So tonight we can finally share with you Kay's new stamps. She started on these such a long time ago last year, and they are beautiful! Her attention to detail is always stunning. Kay has changed it up to go super-size with this release!. Each stamp set has super sized flittery critters, which could be a lot of fun from shrink plastic through to large canvas art as you will see in the ideas below! I can't wait to see what she gets up to with these, and her stencils have, as always, some really innovative opportunities too! So how big does your garden grow!? Hi everyone, Kay here. 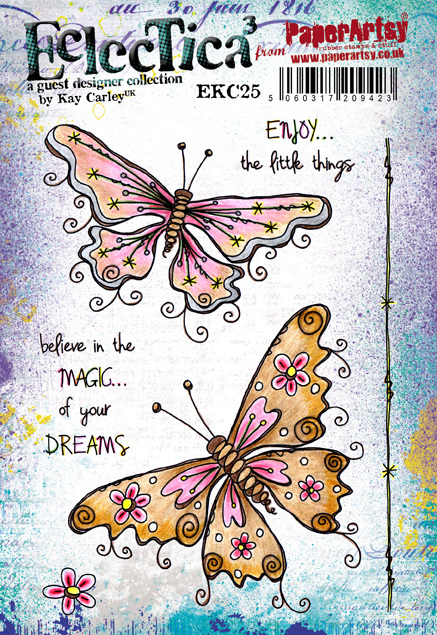 I'm super excited to share with you my newest release for PaperArtsy - 3 stamps and 3 co-ordinating stencils. Recently I have been wanting to make/decorate larger projects such as bigger wall art, tote bags etc... so I thought it would be great to have some super sized flitters and flutters to help me achieve this and having seen Jofy's recent release they can be combined beautifully with her super duper large blooms! 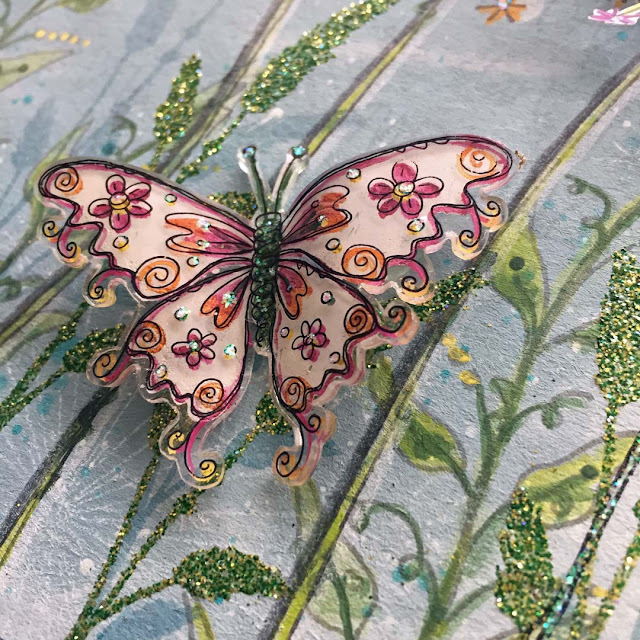 The beauty of having such large butterflies and dragonflies is that they look great when used with shrink plastic as you will see from one of my projects near to the end of the post. 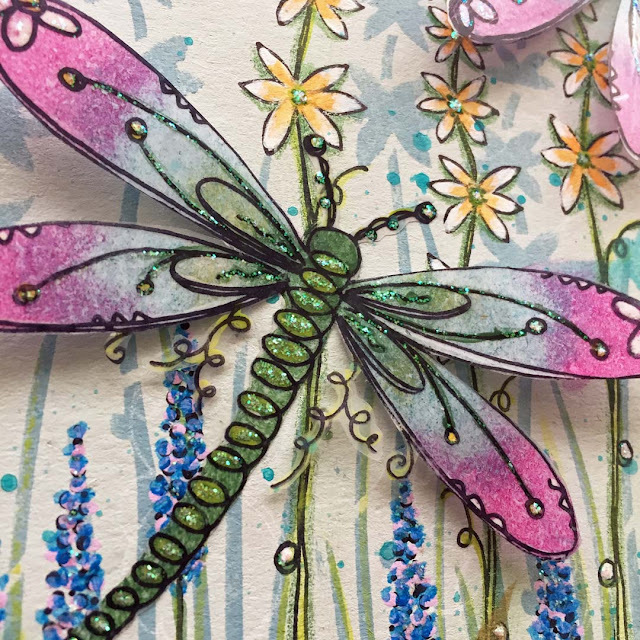 You will find that the stencils co-ordinate beautifully with the stamps - the larger dragonflies and butterflies being the exact same size as their stamped counterparts. 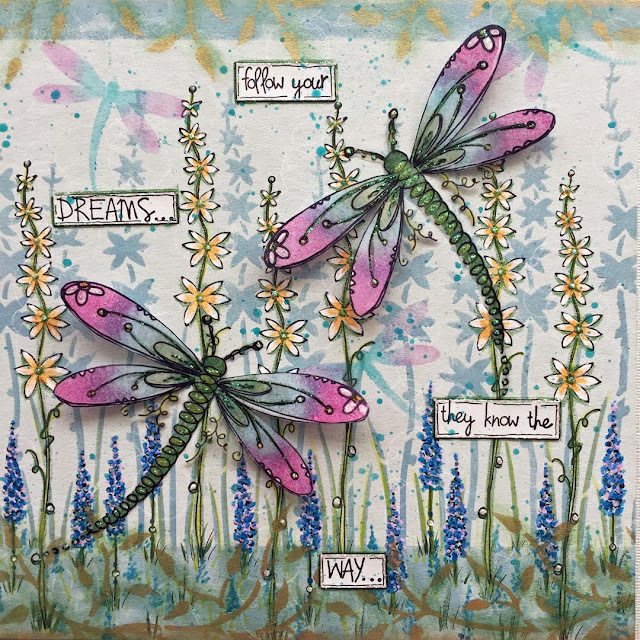 With the dragonfly stencil you also get the 'mask components' of the 2 bigger dragonflies allowing you to add detail onto your stencilled dragonfly simply by popping the mask back into the 'dragonfly aperture' of the stencil and stencilling through your chosen medium. Although you have 2 huge dragonflies on stamp set EKC24 I have actually provided you with two smaller versions as well (!!!) 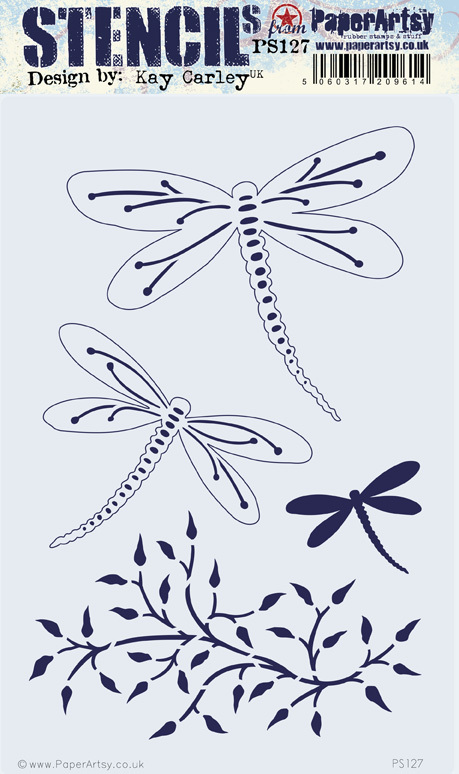 - look at both dragonflies and you will see that you have got 'inner wings' as well as 'outer wings' - this allows you to stamp them onto separate cardstock and cut them out along the 'inner wings' to give you smaller dragonflies - just trim away part of the body/tail of the dragonfly accordingly to suit the smaller wings and adjust the antennas. You will find a smaller butterfly using this method on EKC26 too ;). I had hoped to show you all the different possibilities using these stamps, but due to recent events over the last few months I haven't been able to make many samples. Hopefully, as the weeks go by I will be able to share more samples with you via social media, showcasing all the different ways this release can be used. For now I have got the super talented Keren Baker giving me a hand for this post. 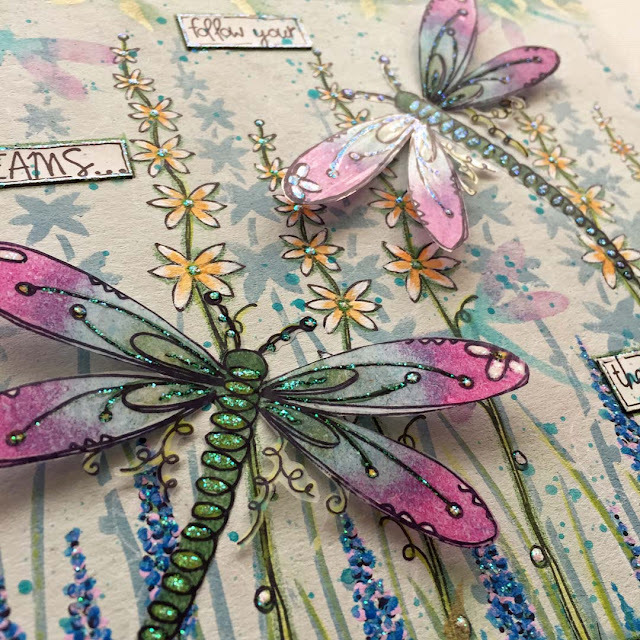 Then, over the next few days, we will be sharing ideas with my newest products from 2 of PaperArtsy's lovely talented bloggers. You can also see ideas on Instagram, Facebook, Twitter, Pinterest. So no matter what your preferred social media platform, we will be sharing with you! Happy New Year! I'll now hand you over to Keren and I'll see you again for the projects near to the end of the post. Let's start with some ideas with each of the new products. with a laminated storage/index sheet. 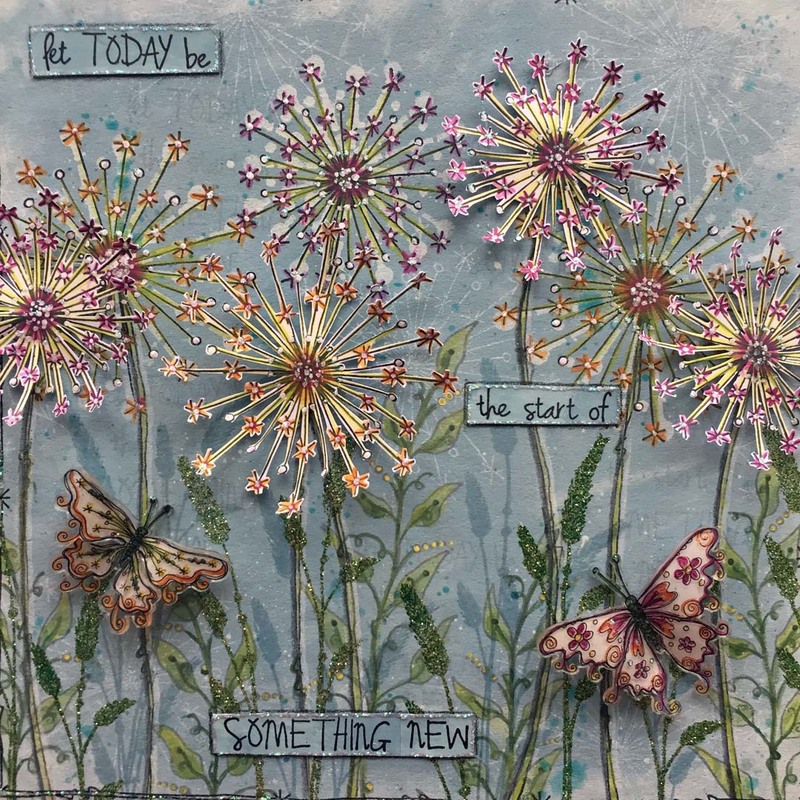 Kay's artwork has such a natural elegance and with these new stamps, I can't wait to create projects like wall art and wearable items with them. The beauty of having larger images is that they make beautiful backgrounds come together so quickly! They lend themselves to acetate and stitching so perfectly. I've combined this stamp set with the PS128 stencil- such a great idea. You only need one of these images to make a real statement so these will be so useful for CAS projects. I just love all the details that Kay has designed into the butterflies. The flowers in this set are simply gorgeous. Perfect as sunbursts or fireworks too. I love how graphic the stencils are when you simply use them as an outline. Intro: I've made an 8x8 piece of wall art incorporating the fabulous flower heads and leaves from EKC26, shrink plastic butterflies from EKC25 and embossed grass stems from my previous grasses stamp set EKC17. If you look behind the flower heads that have been stamped onto the greyboard (you will see some white stencilled flower heads too! The 2 larger circle/flower designs from stencil PS128 were designed to provide a backdrop to the flower heads from stamp set EKC26 in order to help stand them out from a background ;). 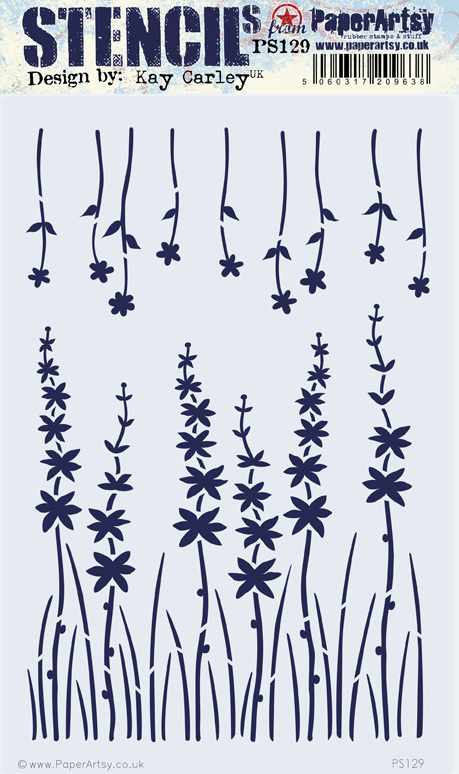 Of course you can use the stencil counterparts to create backgrounds, borders etc... too. 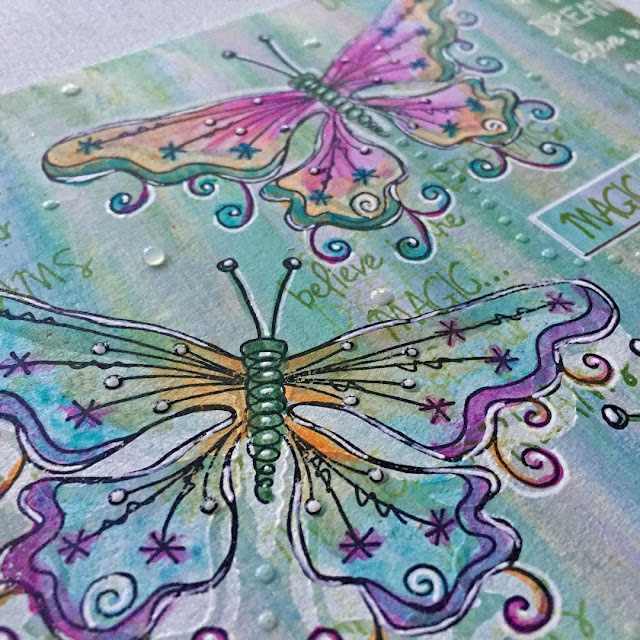 This shows how the stencil butterfly (PS128) perfectly matches the stamped butterfly (EKC25). 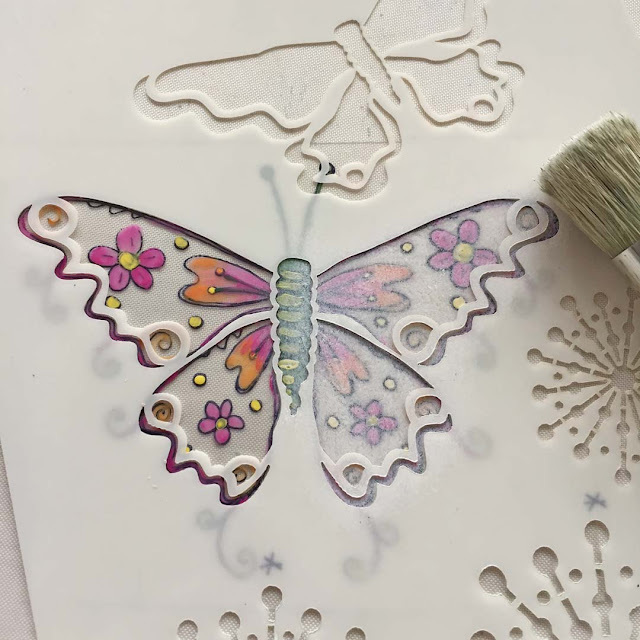 I had stamped the butterfly onto clear shrink plastic, painted it on the reverse side and then stippled Snowflake Chalk Acrylic paint over it using the matching stencil to do this really quickly and easily (as you can see on the right side of the above butterfly). This shows that same butterfly now it has been shrunk! Intro: Here is another 8x8 picture using the smaller of the two dragonflies from EKC24. 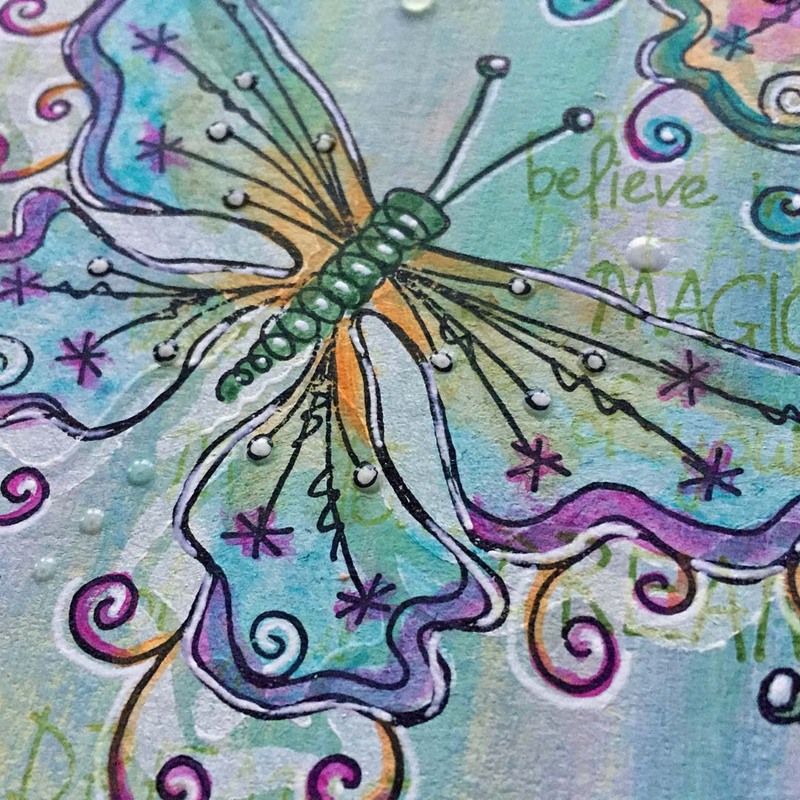 I combined them with the tall flower stamp from EKC26 and matching stencil PS127 along with one of my existing stamps from EKC07. Here you can see how the tall flower stamp and matching stencil work so well together; both being sized to complement each other. The smaller blue dotty flower has been taken from a previous stamp set EKC07. Depth has been achieved to this composition by incorporating some smaller stencilled dragonflies in the background. 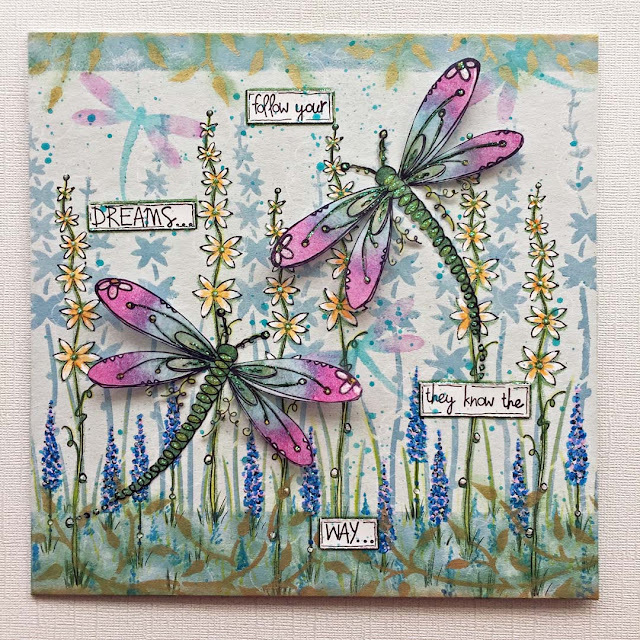 My larger dragonflies were stamped and painted onto acetate, cut out and glued into position to add depth and dimension. 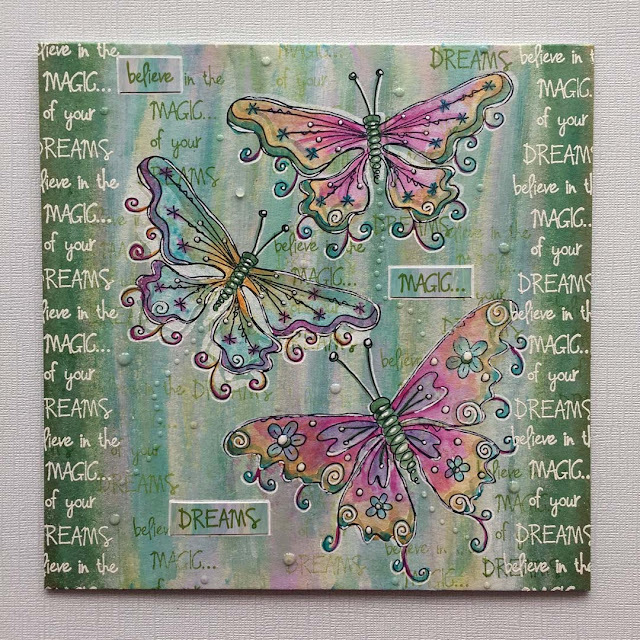 Intro: I've used both sizes of butterflies for this picture (all stamps from EKC25) which fit beautifully onto this 8x8 greyboard but they would look equally good when used on bigger canvas's and would still provide impact. 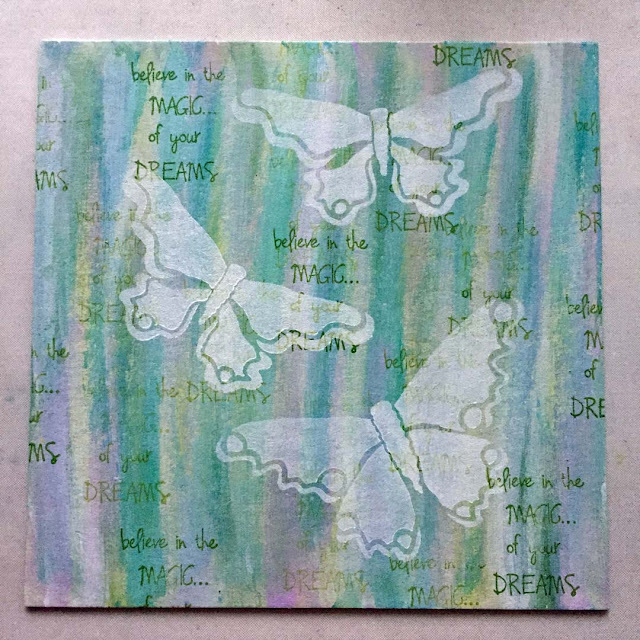 Before stamping my butterflies onto the greyboard you can see that I used the matching butterfly stencil to give me a white background to create my watercolour looking butterflies onto as well as giving a ghost image around the stamped butterflies where when stamping I haven't perfectly lined them up! As you will see from the picture below - it really doesn't matter :). So don't be frightened to try it!! The butterflies have been painted with Frescos but you'd be forgiven for thinking that I had used dye based inks or watercolours! I love the translucency that I've been able to achieve using the Frescos. (As you can see I am never that bothered if I don't stay within the lines either ;)!!!!! I really hope you enjoy using this latest release and if you make anything please do tag me on social media as I would love to see your creations! If you see PA branded items on Amazon, Ebay, Aliexpress, Wish, then they are counterfeit products manufactured illegally without our permission. To purchase from such sites undermines our brand, our retailers and our product designers. We ONLY manufacture RED RUBBER STAMPS (not clear, polymer or silicone). We manufacture ALL our products on site in Essex, UK. We DO NOT outsource ANY of our manufacturing. We EXCLUSIVELY supply the following stockists in this list below. 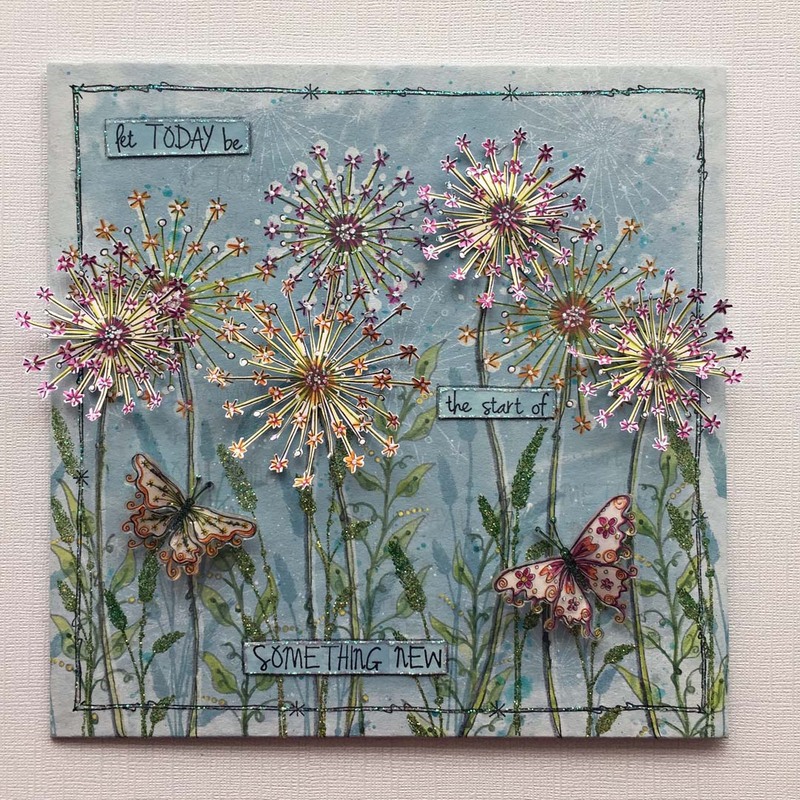 If you purchase from an approved PA retailer, you know you are buying authentic, PaperArtsy made products. Your stamps are as always, stunning and so are the samples - I still can't believe your attention to fussy cutting!! Hope this year will be easier for you and I am so sorry to see the news of your Dad. Much love. 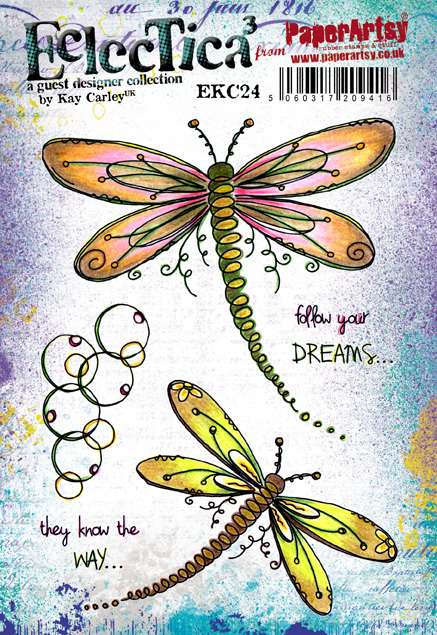 Fabulous stamps and stencils and great inspiration in your samples! 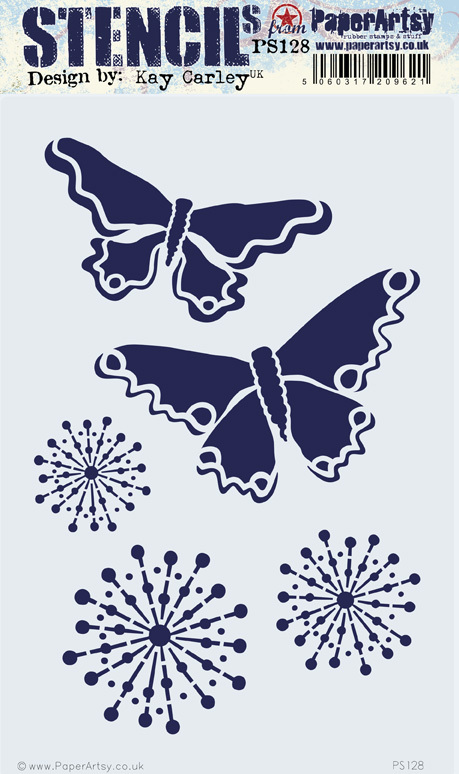 The new stamps are delightful, Kay - and so well thought out for larger projects, and in combining with the stencils. Fabulous samples from both you and Keren! These are just stunning Kay. Wow what stunning creations and wonderful inspiration, thank you x.